Making the top of Off The Mrkt’s list of the New York City’s best historic residential buildings is The Astor, the Gilded Age icon named after its builder, William Waldorf Astor. Like Mad Men before it, The Marvelous Mrs. Maisel has sent New Yorkers on a nostalgic quest to recreate midcentury aesthetics at home, and City Realty rounded up the pre-war buildings around Manhattan that will send residents into a time machine, at least when it comes to high ceilings. Lucky invitees recently got a private tour of a new model residence at The Astor as well as a tasty treat. The Upper West Side condominium was the setting for a private demonstration by renowned chocolatier, Jacques Torres, who served a variety of chocolate creations and bon-bons to visitors from the sprawling home’s newly-restored state-of-the-art kitchen. Mansion Global’s Listing of the Day features a gracious four-bedroom Upper West Side condominium at The Astor. This restored full-block residential icon was first commissioned from renowned architects Clinton & Russell in 1901 and is now being reborn with modern interiors by Pembrooke & Ives. On October 21, 2018, NBC’s Open House began at The Astor, where host Sara Gore showed off the luxurious interiors of one of the Upper West Side building’s condominiums for sale. The pre-war home was shining as Ms. Gore toured the elegant gallery foyer and sprawling, open great room, complete with herringbone-pattern wood flooring and Calacatta marble counters in the kitchen. Residences at The Astor feature interiors that combine new construction with impeccable pre-war bones, so that preserved features such as 10-foot ceilings and wood-burning fireplaces complement new oversized windows and state-of-the-art appliances, creating the perfect Manhattan home. The Mann Report Residential takes you inside The Astor, an iconic 1901 landmark, home to a collection of modern Upper West Side condos for sale. Each home at The Astor is a pre-war treasure with hardwood floors, 10-foot ceilings, and plenty of windows that admit ample natural light. The renovated interiors are decked out in luxe finishes, including white lacquer cabinets and Calacatta Gold marble countertops in the kitchens and additional marble surrounding stone mosaics in the master baths. The classic lifestyle at The Astor is complemented by a suite of amenities that are decidedly contemporary, including the state-of-the-art fitness center, 24-hour concierge, children’s playroom, and bike storage. Originally commissioned in 1901 by the son of famed New York builder William Waldorf Astor, the building at 235 West 75th Street—The Astor—is a landmark of pre-war NYC residential architecture. Now, with the help of Pembrooke & Ives, HFZ Capital Group has renovated these Upper West Side homes into modern luxury residences that evokes classic Manhattan elegance. The spacious condos range in size from one to five bedrooms and feature contemporary interiors bathed in natural light. Residents enjoy state-of-the-art kitchen appliances, windowed master baths, and built-in window seats, as well as access to the building’s fitness center, children’s playroom, and private park. Long gone are the days of foreign buyers purchasing luxury condos in New York City as investments only—these days, they’re making the city their home. 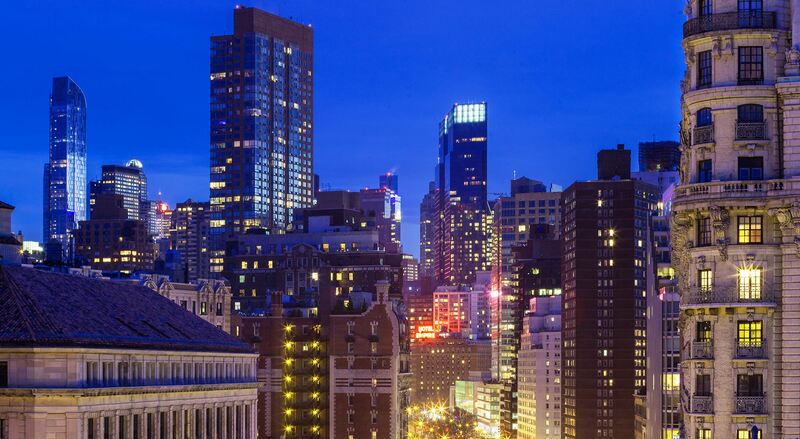 On the Upper West Side, the luxury condos at The Astor now serve as home base for many jetsetters who wish to establish a permanent stateside residence for themselves and their families. The Upper West Side luxury condos at The Astor were bustling with a veritable Who’s Who of international influencers, including real estate magnate Pepe Fanjul and Prince Dimitri of Yugoslavia, at the recent celebration for the 2015 Quest 400 list. Quest Magazine and The Astor brought the city’s most powerful players together on the Upper West Side for “The Astor 400 Tradition,” a celebration of the social elite who helped define New York’s storied culture. New York City is setting up for one of its biggest years so far in luxury residential tower completions. On that list is HFZ Capital Group’s The Astor at 235 West 75th Street. The rental-to-condo Upper West Side development has three towers that will house a total of 66 (199 was the rental count) residences upon completion later this year. The established address spans an entire block and will welcome residents through a fully restored lobby. The condos for sale at The Astor on the Upper West Side expertly combine Old World charm with the high-end modern finishes New Yorkers demand. The three landmark towers, located on Broadway between 75th and 76th Streets, have retained their early-20th-century exteriors and many of their original architectural details while incorporating sleek interior design into their luxury residences. The Upper West Side has always been a top destination for homebuyers in Manhattan, and the luxury condos at The Astor are only boosting the neighborhood’s appeal. Fresh to the market, this prewar building, which occupies a full block on Broadway from 75th to 76th Streets, has been restored and modernized by design firm Pembrooke & Ives. The hotly anticipated rental-to-condo conversions at The Astor have hit the market. Boasting competitive pricing on its one- to four-bedroom units as well as a prime Upper West Side location, The Astor also features interiors fashioned by Pembrooke & Ives. Potential buyers would be wise to act quickly. The much-anticipated Upper West Side luxury condos at The Astor are launching sales in April. The rental conversion property offers everything from wood-burning fireplaces and a kids’ playroom to a gym and bike storage. The weekend of the 24th of January saw parents and children coming in mass to the NYHS for their Annual Family Benefit. Located down the street from The Astor, the NYHS is a wonderful destination for parents and kids alike. Known for its prewar conversions, the Upper West Side offers an attractive residential option for those who prefer neighborhoods that teeter between the classic and the bohemian. With many areas protected by historic districts, the UWS is thriving due to recent conversion projects. The Astor from HFZ Capital is joining this collection of rental conversions in its West 75th Street location. When complete, the 1905 prewar building will have been refashioned into a full-block complex composed of 199 units. The Astor on West 75th Street is the newest in Upper West Side rental-to-condo conversions. The neighborhood is on a roll, with many residents drawn in by the abundance of superb public and private schools nearby as well as the area’s cultural institutions, restaurants, and proximity to Central Park. HFZ Capital plans to convert this historic 212 rental unit into condos, and despite the fact that reps say it will launch sales this fall, few details have been revealed. It's unclear how many units there will be, but Pembroke & Ives have been tapped for the design. Previously, HFZ indicated that prices would be in a more normal range, and not insanely high. New York real estate development company HFZ has purchased four residential properties in Manhattan. The Founder & Managing Principal of the group, Ziel Feldman, is known for converting landmark buildings into Manhattan condos for sale. The company is aware of and motivated by the city’s goal to retain young families as well as attract those just starting their careers. HFZ is a one-stop team of professionals who specialize in renovation, management, construction, and design. Located at 235 West 75th Street on the Upper West Side, The Astor was purchased as part of a four-building portfolio from Westbrook Partners by Ziel Feldman’s HFZ Capital Group. The prime real estate was acquired with a conversion in mind. Due to the limited space available to build new developments in the neighborhood, and with new land at a steep price, Feldman is among those purchasing Upper West Side prewar buildings and turning them into luxury condos. The Upper West Side provides you with an ideal luxury lifestyle that includes exciting fitness options. As a complement to The Astor’s impressive on-site fitness center, the neighborhood offers everything from barre and yoga to interval training, Pilates, boot camp, plyometrics, and more. Being able to diversify your workout from week to week without leaving your neighborhood is a luxury not often seen—even in Manhattan. The Upper West Side and the Upper East Side are equal parts charming, quiet, cultured, and vibrant, and offer convenient access to Central Park. However, despite their shared traits, the Upper West Side offers a more relaxed take on luxury, as evidenced by the design and amenities at The Astor’s elegant Upper West Side condos. With 843 acres of beautifully landscaped greens, wooded glens, ponds, sports fields, and a professionally appointed amphitheater, Central Park is the ultimate backyard, and proximity to it is one of the most desirable amenities that any Upper West Side condominium can provide. No matter your taste or age, there’s something for everyone in Central Park. Don’t miss out on these upcoming performances and ongoing activities in the city’s marquee public space. The Astor, recently revitalized to become one of the premier luxury condominiums on the Upper West Side, is a direct and immediate descendant of America’s Gilded Age of the late 1800s. During this period, a rapid influx of wealth led to a surge in industrialization and the construction of the many structures that served to redefine urban architecture. Over these few decades, urbanization and New York’s population grew exponentially, and as the Gilded Age faded into the background, it left behind a wildly diverse and vibrant new cultural and architectural landscape that fostered creative expression. The Astor, which was “born” in 1901, helped to cement the Upper West Side’s reputation as a home for the wealthy business class and serves now as a vivid testament to the refined grandeur of the past, as well as an example of high-end contemporary urban living. Much in the same way that The Astor has improved with age, a large swath of the art created as a part of this era has followed suit. Manhattan's Upper West Side (UWS) is a neighborhood overflowing with renowned cultural institutions. From Lincoln Center to the Museum of Natural History on down to Juilliard and the School of American Ballet—the offerings are as diverse as they are celebrated. Residents of The Astor condos—centrally located in the UWS—can take a short stroll to experience some of the best performances New York has to offer. Here are our four favorite local cultural offerings for this summer. For foodies who love to create their own culinary masterpieces, the kitchen is where themagic happens. In New York, the upscale kitchens in the condos at The Astor, a collection of luxury condos on the Upper West Side, make for an impressive stage, indeed. Each sleek, integrated suite is outfitted with the most state-of-the-art appliances on the market from brands such as Gaggenau, Miele, and Sub-Zero. As for serving up your feast, each condo at The Astor also comes with a custom-millwork tabletop by interior designers Pembrooke & Ives. Forget about the cold-weather blues—enjoy a night out on the town that includes one of The Beacon Theatre’s must-see shows this season. Just a one-minute walk from the Upper West Side condos at The Astor, The Beacon is set to serve up music and comedy offerings that are well worth the short jaunt outside. If you live a bit farther away, The Beacon’s star-studded schedule may entice you to check out The Astor or other nearby NYC condos for sale. New York City's shopping is famed for being as diverse as it is vast, the city's landscape dotted with everything from world-class luxury brands on the Upper East Side to chic boutiques from up-and-coming designers in Tribeca and Soho. However, for those who want everything under one roof, there's only one destination that fits the bill: the Time Warner Center. In a neighborhood full of New York City history, just blocks from the Beacon Theatre, steps from Central Park (and Tavern on the Green), and a short walk from some of the city's most beautiful buildings, like the Manhattan condos for sale at Gilded Age beauty The Astor, it's easy to find plenty of reasons to visit this unique Columbus Circle shopping destination. When temperatures drop and the nights grow longer, things really heat up at Lincoln Center. Even those who are tempted to hole up against the elements in their New York penthouses and luxury condos find themselves venturing out to the bright lights and expansive spaces of the Lincoln Center campus for some culture during the fall and winter. Fortunately, the Lincoln Center concert schedule for the rest of 2015 offers a fantastic selection of classical, jazz, and holiday performances. One of the primary reasons NYC is such a desirable place to live is its abundance of landmark cultural institutions. The city is filled with true havens for the arts that have been thriving for over a century as well as newer additions that have diversified the scene. Within Manhattan itself, one would be hard-pressed to find a neighborhood as storied and respected as the Upper West Side. And centrally positioned within close distance to the world-famous performing art spaces and more intimate and unique venues of the UWS, The Astor has long been a part of this most venerable of Manhattan neighborhoods. "Tile Revival: The original mosaic tiles at the Astor’s lobby have been lovingly preserved, and are a unique reminder of the Astor’s history and place in New York City architecture – this piece will discuss the inspiration behind this tilework, giving prospective residents more information on an often-overlooked design element." The luxury condos of the newly renovated Astor return the Gilded Age building to its originally intended use as luxury apartments. Uptown vs. Downtown: What’s your Preferred NYC? New York City’s downtown neighborhoods may get lots of buzz, but the Upper West Side is, according to The New York Times, holding up its end of the conversation. Let’s take a look at what downtown NYC has to offer in a variety of categories, and how the Upper West Side counters in each. What could be better than living in a neighborhood that combines the genteel comforts and amenities of artfully renovated prewar buildings with world-class cultural offerings? The Upper West Side luxury condos of The Astor are perched in a prime spot that offers easy access to amazing live performances throughout the year. This fall features a stellar line-up that’s sure please, regardless of your musical preference. New Yorkers with families are gravitating toward the Upper West Side, drawn by the abundance of top-notch schools, ongoing activities for children, and family-friendly luxury condos from developers who have dedicated portions of their buildings’ amenities to kids. Future residents of The Astor on West 75th Street can confirm that the array of local kid-friendly activities for children under ten (give or take a few years) adds up to a neighborhood full of options for indoor and outdoor fun. Built by William Waldorf Astor in 1901, The Astor embodies Gilded Age elegance on the Upper West Side. While other projects included the original Waldorf Hotel, his cousin John Jacob built the adjoining Astoria (as well as the Knickerbocker and the St. Regis) before perishing on the Titanic. The Astor family were the nation’s first millionaires. Widely known as the landlords of New York, they were also the stars of fin-de-siecle society. The Astor’s legacy and sway in the city lasted for almost two centuries. Each weekend with The Astor as your home base would be like none other. Start with a Saturday-morning breakfast in a kitchen that’s an exercise in elegant efficiency. The high ceilings and generous windows let the morning light in, making the open-plan, eat-in kitchen a welcoming space in which to contemplate an espresso. Look carefully at the exquisitely restored Roman-inspired mosaic that greets visitors in the lobby of The Astor, and think how different New York City is now compared to 1901, the year construction on the building began.